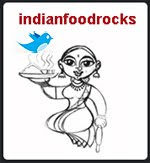 As most of you know, I have been busy with menu planning and other details for my Culinary India workshop, to be held June 16-17, 2012 from 10am to 2pm on both days. Escoffier Culinary School of Arts, Boulder, is offering a special discount for IFR readers, making this workshop even more attractive. Sign up online before end of day Wednesday June 13th, enter the code MANISHA and pay only $400 for the workshop. Or call Ellie Scott of Escoffier at 720-204-3492 and mention this offer. This workshop makes for a perfect Father's Day gift, too. At the workshop, we will explore the cuisine of India by learning techniques and recipes from Top Chef Master Suvir Saran, food historian and researcher Ammini Ramachandran, restaurateur Asha Gomez, and your favorite Indian food blogger — me, of course! Also included are signed copies of Ammini's cookbook and my vegetarian Bible, Grains, Greens and Grated Coconuts, as well as Suvir's latest cookbook, Masala Farm. Please feel free to share this fabulous offer with friends and family in the Denver/Boulder area who have an interest in Indian cooking. Looking forward to seeing you there!